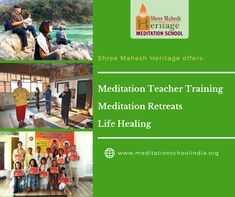 At Meditation School India, Shree Mahesh Heritage, The first Meditation School of Rishikesh, you will learn and experience the best passive and active Meditation techniques rooted in ancient Indian Vedic system of health, healing, well-being, and self-realization. 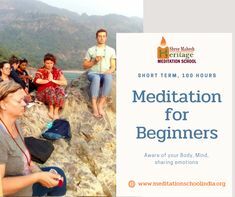 Whether you come for a Meditation teacher training course, spiritual yoga meditation retreat or meditation for beginners program or for your personal spiritual development, practicing with us will make you understand the basics of your own mind, body and intellect, their obstacles and how to overcome them using different eastern and western meditation techniques. With full respect and mutual sharing, we will help you, providing favourable situations, customized yoga Meditation pre-practices, simple and natural self-healing techniques working on your physical, mental and emotional health with intellectual clarity. You will discover what you are deeply seeking, and will enjoy your learning and experience in a very comfortable, caring and joyful atmosphere naturally! 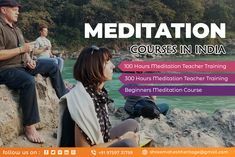 Our 300-hour Meditation teacher training course is a long term four weeks intensive program which has been designed to give you the knowledge, skills, experience and confidence to teach Meditation to a range of clientele in group or individual. 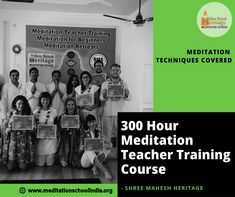 Your Meditation Teacher Training with us will help you to gain a deeper insight of Meditation knowledge in form of practice, philosophy, Anatomy- physiology, teaching methodology and experience as embodied in the ancient Indian Vedic texts with the modern scientific approach. Meditation has become a valuable tool for finding a peaceful oasis of relaxation and stress relief in a demanding, fast-paced world. It can be used for healing, emotional cleansing and balancing, deepening concentration, unlocking creativity, and finding inner guidance. Apart from reducing anger, anxiety and mental stress of daily activity. Restore, promote and enhance your health. Experience the simplest and easy to follow the ancient Indian Vedic approach of health, healing and well-being which gentle, non-invasive and no toxic side effects. These therapies are highly recommended for disorders like a migraine, anxiety, stress, depression, Insomnia, asthma, back pain and all sorts of phobia. Also works in a disease like Parkinson, Alzheimer and dementia. Come and study basic steps of Ayurveda in an easy and simple way. Ayurveda literally means “science of life and longevity.” and is considered to be the most traditional and oldest health care system of India. It is a qualitative, holistic science of health and longevity. Tomar had the master degree in physical education and then completed PG diploma in yoga from Kaivalyadhama, Lonaval India in 1993. He is sharing his experience of yoga in all its various forms with global students including India. His knowledge of Hatha, Ashtanga, Tantra, Kundalini Yoga and Vedanta has been deepened by the guidance of many Indian spiritual teachers. Rajnee carries a Master degree in “Science of living, yoga and meditation” and also hold certificate in Ayurveda and Health conservation from Haridwar university. 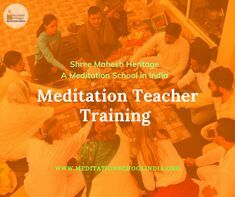 She has been working for more than ten years with ‘Krishandutt yoga and Naturopathy’ centre, delhi to plan diet for their in-house patient, now has been given the charge of kitchen at Shree Mahesh Heritage for meditation students. Pandit Ganesh Shastri belongs to Hindu Brahmin Family, known well for living under Vedic Lifestyle passed through their ancestors. Vedic LIfestyle Teacher He is a priest, a student of Sanskrit grammar and an astrologer, practicing all this for last more than 25 years. Our location- Rishikesh, India, the World Capital of Yoga & Meditation, the Spiritual hub of Yoga Holidays,Vacation,Residential Yoga Meditation courses, Meditation teacher training, Meditation retreats, meditation ashrams, many other traditional meditation places in the lap of Himalayas, and Veda Mantra chants facilitates a perfect Mecca for spiritual seekers for meditation practice in India. – We are just at 5 minutes walking distance from Tapovan main market and 10 minutes Laxman Jhula, Ganga river. – 300 hours program in four weeks duration, means, more hours for…. Over the duration of this course, Ram shared his knowledge and became a friend. I feel much more prepared to continue on my spiritual journey. We only had five short days together, he gave me the tools to help me experience much greater success in my meditation and yoga, thanks to his teaching. Thankyou Ram for your kind and gentle care. I wish I would have more time here in rishikesh to continue my treatment with you. I highly recommend ram for anyone looking for guidance for their healing journey. A very enjoyable experience overall. Namste. 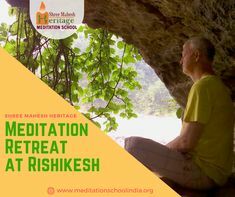 Meditation teacher training in India at Rishikesh Shree Mahesh Heritage, a Meditation School, registered with Government of India. 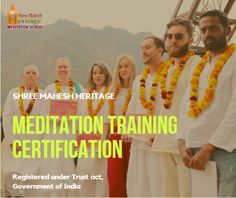 It was a life changing experience for me to join customized program at Shree Mahesh heritage, I wish that I would have more time here in rishikesh to continue my practice. 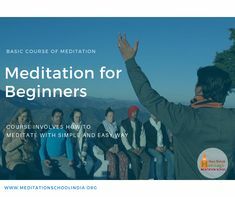 I highly recommended this place for anyone looking for guidance in Meditation training and Life healing program. Ram Gupta is great, carrying lots of experience understanding the need of the person in front of him. Thank You for giving me a lifestyle supported routine to follow! Namaste. “Matt I’d like to say thanks for the course. 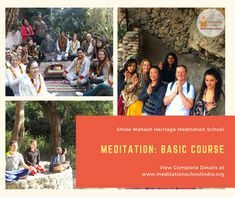 I am so happy to have attended and learnt so much about meditation and understand that I have so much more to learn and experience… I also have to mention that I have also learnt some things about myself too. So thank you for being the teacher that you are.” — Kim R.
“Thank you for all your time. I am going to miss our workshops. You have been marvellous and I really appreciate your teaching style. Hope I get to be as good as you!” — Susi A.